Someone over at Popeyes Louisiana Kitchen's marketing department has a sick sense of humor. 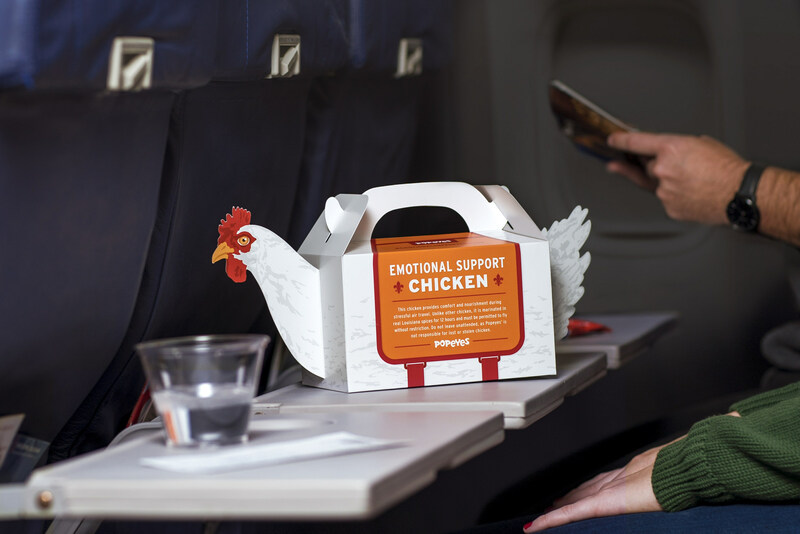 For Philly fliers, the fast food chain is offering "Emotional Support Chicken" which are specially-marked, chicken-shaped carrier boxes filled with, yep, fried chicken. This chicken provides comfort and nourishment during stressful air travel. Unlike other chicken, it is marinated in real Louisiana spices for 12 hours and must be permitted to fly without restriction. Do not leave unattended, as Popeyes' is not responsible for lost or stolen chicken. Emotional support animals provide comfort and companionship, especially during a highly stressful time like air travel. However, according to recent headlines, some travelers are pushing the envelope with the types of animals they try to bring on flights and classify as "emotional support animals," including the likes of peacocks, squirrels and tarantulas. Knowing this, Popeyes decided to launch its new "Emotional Support Chicken" to bring holiday travelers some humor to what is one of the most stressful places to be during the holidays – the airport. "Emotional Support Chicken" is ONLY available at the Gate C31 Popeyes in the Philadelphia airport.